May I invite you to join me for Canary Islands Classical, a very special journey from Lisbon to Barcelona for listeners of Classical 96.3 and 103.1 FM. Next April I am going to take a couple of weeks off from speaking into the Classical 96.3FM mic, to take a dream cruise to explore a very special part of the world, and it will be even better if you can join me. Our trip will be fully escorted by Joe and Zaneta Rochemont, who are renowned in the travel industry for looking after every detail. We have specially tweaked Crystal Cruises’ Canary Island Classic, adding irresistible elements for classical music lovers, so for us it’ll be the Canary Island Classical! Great music, fabled destinations, blue ocean as well as a couple of hikes up mountain tops, famous architecture, historical immersion, and of course 5 star gourmet food and wine all the way. Who could ask for anything more? 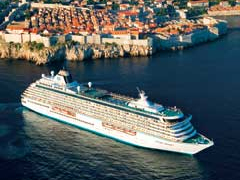 From Lisbon, Portugal we’ll board the luxurious Crystal Serenity, where we’ll immediately get why Crystal Cruises has consistently been voted #1 in the midsize category by Conde Nast Traveller for the past 17 years. Our sea voyage visits the beautiful Canary Islands, where there’s a strong classical music tradition, as all the big European orchestras used to stop off there en route to concert tours in the Americas. Then on to the steamy kingdom of Morocco, with a stop in Casablanca, on the way through Spain. Barcelona is our grand finale, I can hardly wait for our tour of the crazy brilliant buildings of one of my favourite architects, Antonio Gaudi. As for the musical elements of our trip, I can hardly wait for that either. Get out your kleenex in Portugal where we’ll hear the beautiful melancholic Fado, from the Latin for fate or destiny. Fado is such a treasure, it was inscribed in UNESCO’s Intangible Cultural Heritage Lists in 2011. And in Spain of course it’s Flamenco, that hot, sensual, completely mesmerizing national dance. Free evenings on the boat, join me at sunset for a glass of champagne on the Lido Deck, or, if the food has been way too good, maybe we’ll just take our bubbly to the treadmill….And I’d like to invite you to bring along a short bit of classical music that has changed your life, or that you cannot live without, we’ll share those with each other on another evening on the ship…I can’t think of a better way to get to know each other. OK, gotta go and figure out what to pack! Click here for the complete itinerary, booking information and more.